"Leaders in Liquid Bulk Packaging"
Paper Systems offers a wide variety of disposable liquid packaging solutions, recyclable designs, source reductive, and an innovative range of liquid bulk containers from 110 gallons through 330 gallons and liquid tote liners. 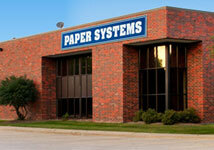 Paper Systems works our liquid IBC container customers in the industrial bulk packaging markets to find the right bag in box solution for a wide variety of bulk liquids, food grade, aseptic, or other viscous materials. Paper Systems family of liquid IBC packaging products includes the “EZ-SET”, “EZ-BULK”, “EZ-DRAIN”, “EZ-BULK 48 X 40”, and “EXO-BIN”. Paper Systems has been a liquid packaging company leader in liquid bulk totes and disposable liquid liners helping pioneer liquid tote container packaging to the industrial liquid markets for over 30 years. Liquid disposable totes, returnable totes, replacement plastic liners products all lead to bulk packaging solutions where we partner with our customers for long term industrial packaging solutions. Call today for your liquid tote container solutions that will help you for tomorrow! EZ-SET liquid storage containers can be assembled, collapsed flat, or custom printed. EZ-SET comes with “POP OPEN–STAY OPEN” technology. The EZ-BULK 48x40 Series® liquid container combines all the benefits of EZ-BULK with the added feature of being compatible with a 48x40 pallet size. EZ-BULK® is a bulk liquid transport container system to give your company a competitive edge in shipping non-hazardous liquids in bulk. Meet the EXO-BIN® — the perfect liquid transport container for liquids or dry products. Reusable and collapsible, it stores up to 320 gallons.